magical place. 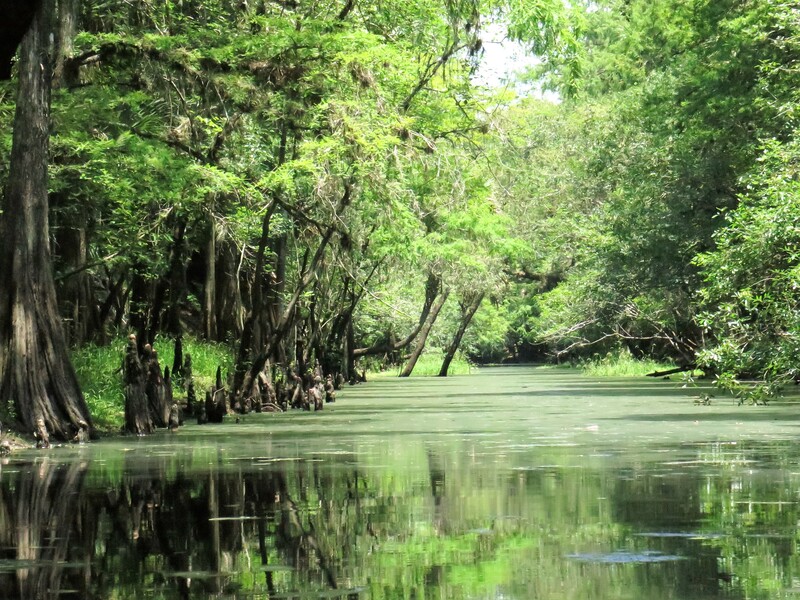 Tall cypress embraced the waterway and added a welcomed shade on a hot day—in the 90s already. My sister had suggested we paddle Deep Creek in Volusia County. I didn’t even know it existed! Deep Creek flows from the northwest—I believe originating from run-off (from what I could tell from the topo map). It merges with the Lake Ashby Canal at some point before our put-in location on Maytown Road, and it empties into the St. John’s River somewhere before Lake Harney—just a few miles away. I found little information about Deep Creek online or in my guide books. So, we pushed away from the shore, looking down the twisty, narrow waterway, low banks on both sides. Cypress knees outlined the edges of the dark water, fresh pink growth poking through the bark. We paddled towards the St. John’s, coming across our first deadfall ten minutes later—and ducked under. We loved the peaceful tranquility and the many twists and turns of Deep Creek! Our paddle was quiet with the exception of the hum of the cicadas and an occasional bird call deep in the woods. For a time, a great heron led our way up the river. If you look closely at the one picture, you will see a thin dusting of green pollen on the top of the water–perhaps because it was so still–and I’m not sure that is a bad thing. However, somewhat troubling was the very large number of Amazonian apple snail eggs that sat on top of the cypress knees. Sadly, these are the invasive species, not the Florida species, and can cause great harm to the ecological system of the waterway. 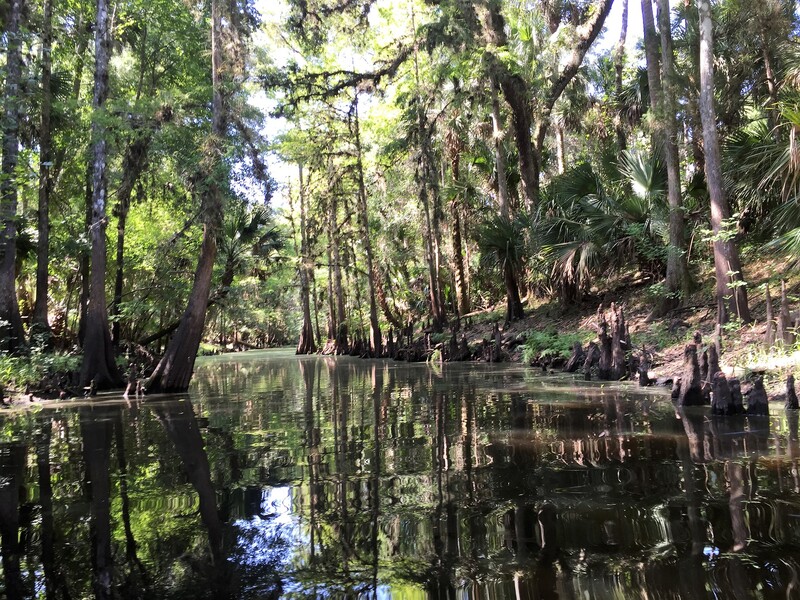 My sister and I paddled about three miles towards the St. John’s River, stopping on the side of the creek for a snack and a stretch—before turning back in time to meet the outfitter. Great narrative essay, Susan! Had always wondered about Deep Creek. The map shows it winding a great distance between Lake Ashby & the St. Johns just downstream of Lake Harney. Have only seen where it confluxes with the SJ south of Harney, and across from the ancient shell middens & and ferry boat launch on the east shore of the SJ. Thanks, Bill! It really was a sweet waterway, just very sad about those snails. It would be fun to paddle the entire way to St. John’s. I think it’s about 7 miles or so. Another way to do it would be to paddle up Deep Creek from the St. Johns. There’s a put-in there nearby. If you want to give it a go, let me know. That’s what the outfitter typically does when they give tours. However, from where they put in it was a long paddle to Deep Creek and it was a sweltering day. St. John’s is so open.